Set in the area of Albaicin this modern hotel is within easy walking distance of the Monastery of Saint Jerome. The hotel is a five-minute walk from many attractions including Royal Chapel of Granada, the Madrasah of Granada and Granada Cathedral. The Hotel Macia Plaza offers a convenient 24-hour reception as well as a safe, a currency exchange and room service. The hotel also offers a dry cleaning service, laundry facilities and internet. The hotel's staff are on hand to assist you with any extra requirements you have. 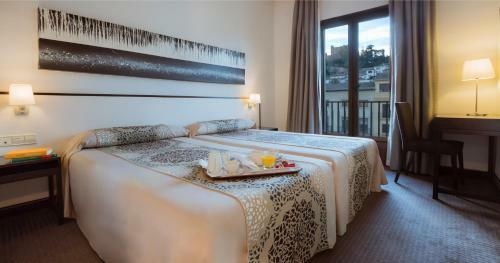 The Hotel Macia Plaza offers stylish and comfortable rooms equipped with a TV and a telephone. To make sure your day gets off to a great start, the hotel serves a buffet breakfast daily. For other meals, there are plenty of restaurants and cafés situated nearby. Located just a stone's throw from a number of popular hot spots, the hotel is in close proximity to lots of bars, nightclubs and quality restaurants. Generalife is under a 20-minute drive from the hotel. This hotel is 1100 metres from the Alhambra entrance, 22 metres from Plaza Nueva (the absolute centre of Granada), 1577 metres from the train station and 3005 metres from the bus station.